Times have changed for Superman. The ‘Man of Steel’ – one time hero of the people who could seemingly do no wrong – is now being considered a threat to mankind if his superpowers cannot be brought under some kind of control. Enter Batman who takes it upon himself to curtail what he sees as the imminent danger Superman poses for the people of Earth. However as the two superheroes meet in a no holds barred confrontation, an old adversary is waiting in the wings who has created a force which will cause destruction on an apocalyptic scale. 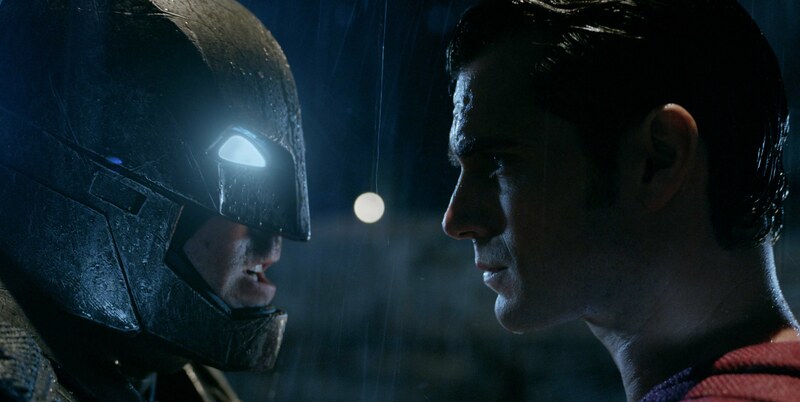 First we may as well make it clear from the start that, no matter what the critics say, Batman V Superman: Dawn of Justice – the latest superhero blockbuster to hit the big screen, directed by Zack Snyder and featuring Ben Afleck and Henry Cavill as the crime fighting rivals – is going to be another guaranteed smash. There are enough fans of these clone like adventures – which are now churned out with almost conveyor belt like regularity – to ensure that each successive film is a bigger and brasher hit than the last: this year we have already had Deadpool, and can still look forward to Captain America: Civil War, X-Men: Apocalypse, the dubiously named Suicide Squad and Doctor Strange. It’s considered sacrilege amongst comic book fans to say anything negative against these films even when – as in the case of this new teaming of the ‘Bat’ and ‘Man of Steel’ – it’s clear to anyone with even an ounce of creativity or originality, that they have run out of steam. So, with that cleared up, lets take a look at the film objectively. In the old days – by which I mean the age of the Richard Donner / Christopher Reeve Superman (1978) or Tim Burton / Michael Keaton Batman (1989) – there was something fun about the heroes, and inexplicably appealing about the villains: Jack Nicholson’s Joker may not have been physically attractive in Batman, but he had an undoubted allure about him as he went joyfully caused chaos in a carton-like Gotham City. Jump forward twenty odd years and it’s a very different story. In this new take on the age old stories, the filmmakers have pitted the boys against a twenty-first century take on Superman’s deadly foe Lex Luther (Jessie Eisenberg) – seemingly incapable of expressing himself in anything other than snappy, Tweet generation, soundbites – and the epically proportioned monster Doomsday, the only real interest about whom lies in his central role in the recreation of King Kong’s famous climatic battle. Everything else about this film – from the opening rehash (yet again) of the traumatic childhood incident which forced Bruce Wayne to become what he did, to Superman’s feeble, put-upon alter-ego, newspaper employee Clark Kent and his ongoing battle with his tyrannical editor Perry White (portrayed here by Laurence Fishburne) – seems like it’s been seen before. Admittedly certain characters – Clark’s love interest Lois (in the form of feisty Amy Adams), his adoptive mother Martha (Diane Lane) and Bruce’s ever present butler / righthand man Alfred (brought to life by the appropriately aristocratic Jeremy Irons) – have to be present. However the arrival of a mysterious newcomer Wonder Woman (Gal Gadot) – who appears at the last minute when everything is nearly done in order to help save the day – feels as though it’s simply an excuse to introduce her in readiness for her own big screen adventure next year. Past screen treatments of Batman and Superman were given more of a surreal, cartoon-like feel, which in turn leant them a smoother and more general, mass audience appeal. Tastes change however, and the people behind these modern interpretations of the characters will simply say that they are moving with the times and that their slant is in fact closer to the dark and gritty verisimilitude of the comic books from which they draw their inspiration. This may be so. Sometimes however, the public would prefer movies with provide an escape from the harsh realities of the world around them. Something which Batman V Superman: Dawn of Justice unfortunately doesn’t. ‘Sound bite’ of the week …….